Now THAT’s a solar array!! It was a hot one! 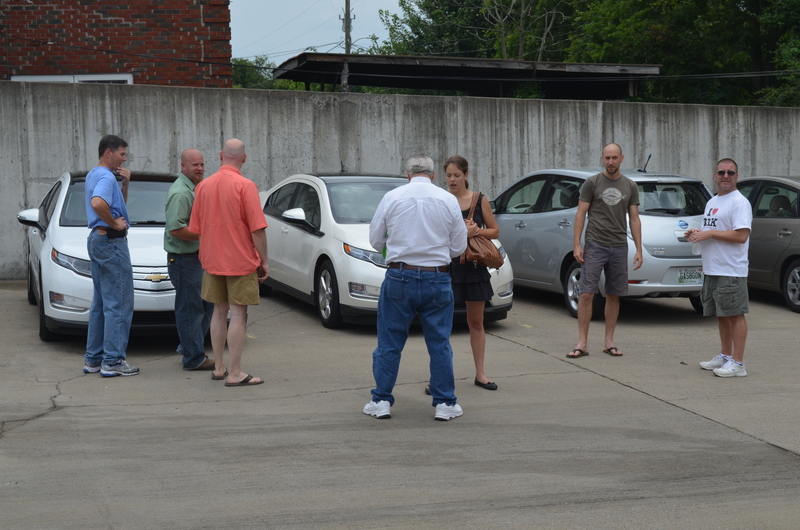 Integrated Solar acted as host to the Nashville EV meetup. 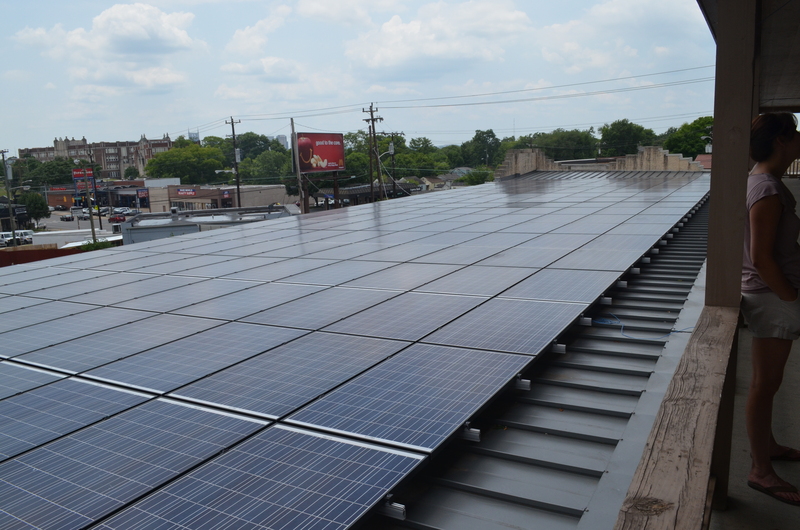 They have a massive solar array on their flat roof which will provide free electric for three Blink level 2 chargers at the rear of their property and a soon to be installed Level 3 charger at the front of their facility. They have promised free EV charging to all comers with no plans to charge for the electric, ever!! A level 3 charger close to downtown Nashville will be an enormous benefit for the EV community in Nashville. EV’ers talk about you know what, you know why. Billy of Integrated Solar took both a Mitsubishi I-MIEV and Nissan LEAF for a spin, quite literally. He spun the Mitsubishi’s tires on the way out and did a side-on slide entrance on his return with all four tires screaming for mercy!! Apparently it is not easy to roll an EV. He had the EV Grin!! Me thinks he’ll be buying an EV real soon!! Why not? He can charge for free at work!! Turnout was great with two Volt’s, Two Mitsubishi’s and and least 5 LEAF’s. I got whole lot of question answered regarding solar systems. Maybe I’ll be charging for free before too long!! 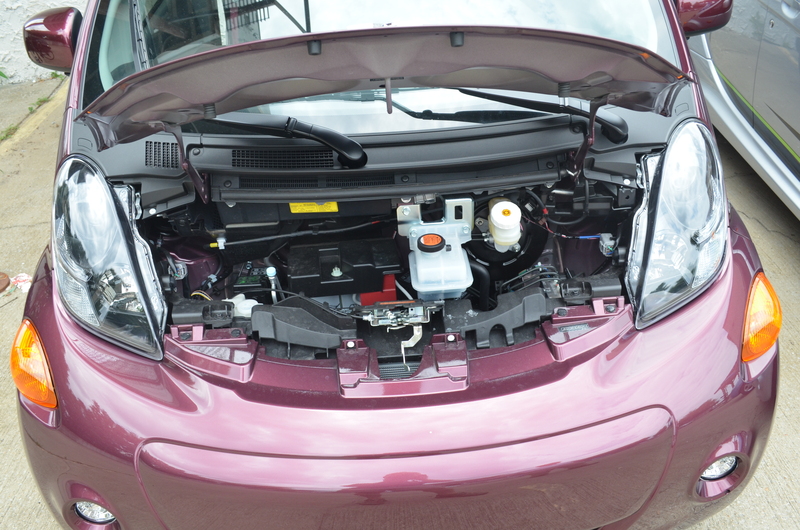 Gubbins under the hood of an I-Miev! A GE Watt-station was on display, unfortunately it was non-working display unit. GE have a nice looking EVSE! For further commentary and pictures visit the event’s Facebook page!! This entry was posted in Blink, Electric Car, Level 2 EV Charger, Level 3 EV Charger, Nissan LEAF, Test Drive and tagged free ev, GE Watt Station, GM, Integrated Solar, LEAF, REC, solar, solar array, transportation, volt, watt station. Bookmark the permalink.